This beautiful RFID Blocking Western Trifold Wallet is shielded to protect you from electronic pickpocketing. It can hold 8 cards, which includes an ID window. Each of the three sections has additional card storage in the larger pockets behind the banks of slots. 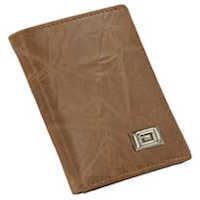 There is a billfold area, which is also RFID shielded. 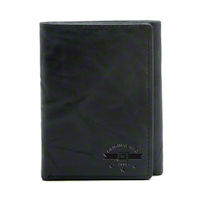 The inset chrome logo adds to the rugged look of this wallet. The top grain leather will allow for a beautiful natural patina to develop over time.